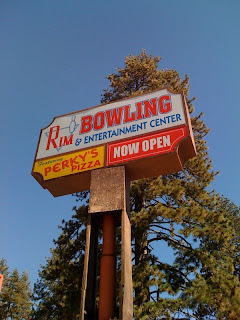 Rim Bowling and Entertainment Center; Crestline, California. 3 strikes and you’re out, however that is not the case with the family owned Bowling Alley in Crestline. The establishment was reopened in 2008 after an unexpected shutdown in early 2003. The new owners of Rim Bowling also own two other Subway shops located in Lake arrowhead and Blue Jay. The establishment was a piece of history to Crestline, after its closure many locals were disappointed. This was an local hangout spot for many community members. Growing up in a small town community, they would often frequent the bowling alley formerly known as “Tiki’s Paradise Bowling Alley”. 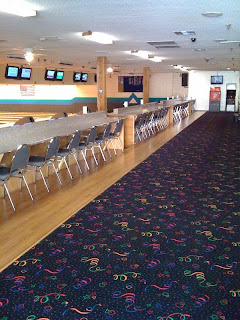 The alley was restored, a complete interior makeover which included new carpeting, new tiling, furnishing, state of the art equipment and an new arcade center. A new venue was also added, Perky’s Pizza Parlor; which serves an assortment of Pizza, Chicken and a variety of drinks. It is rumored that a third subway will be opened sometimes in the future. Yum! From the moment you walk in, you are greeted with charismatic staff members. Like I said, Locals know best; the establishment quickly became an new hot spot for Crestline. Rim Bowling Center quickly received accolades of recognition from the press, and the community as well. Families often frequent this wonderful establishment because it is an warm inviting atmosphere where families can spend time with each other, restore their family values after a hard days work. Rim Bowling and Entertainment center brought back fun to a small town in the mountains. Happy Bowling and Happy Travels!